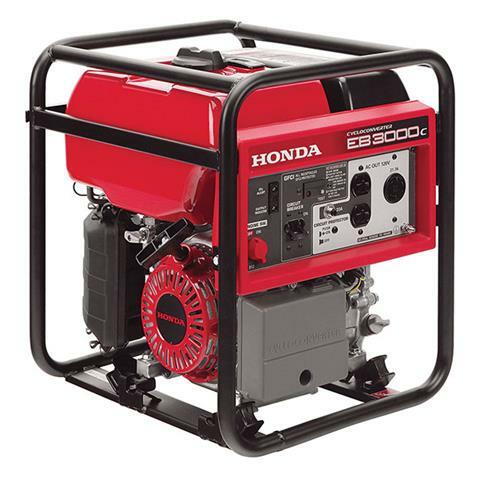 Honda portable generators are the number one choice in the construction and rental industry. RATED #1 BY CONSTRUCTION AND INDUSTRIAL USERS, YEAR AFTER YEAR: An independent survey of construction and industrial users has consistently rated Honda the #1 generator. Why? Our legendary reputation for performance, durability, and reliability. MORE POWER, LESS WEIGHT: At only 71 lb., the EB3000c is Honda's lightest industrial generator. Honda's exclusive CycloConverter technology allows you to get more power with less weight. EXCLUSIVE CYCLOCONVERTER TECHNOLOGY - CONSISTENT POWER OUTPUT: CycloConverter technology uses a special CPU to create stable, high quality power with less weight, compared to a traditional generator. EASY STARTING HONDA COMMERCIAL OHV ENGINE: Legendary Honda commercial-grade OHV engines are reliable, easy-to-start and incredibly rugged. LONG RUN TIME: Operates 9.4 hours at 50% load, using only 2.6 gal. Keeps you working, all day long. ALL CIRCUITS GFCI PROTECTED: The EB3000c offers neutral bond and full generator GFCI (Ground fault circuit protection) on all outlets. OSHA WORKSITE COMPLIANT: The EB3000c was designed to meet OSHA requirements, making it ideal for worksite applications. QUIET OPERATION: 68 dB (A). MEETS OSHA, LA-ETL, AND ANSI REGULATIONS.